Luke Skywalker ponders his future against the backdrop of Tatooine's twin suns (a binary star system). An iconic shot from the classic sci-fi movie Star Wars, is Luke Skywalker walking on his home planet of Tatooine with its twin suns (Tatoo 1 and Tatoo 2) as its backdrop. Tatooine is a fictional planet as well as its two suns but it seems that despite the improbability of a planet orbiting a binary star system, they exist. Not a binary system but a triple-star system was discovered by Maciej Konacki on July 13, 2005. The system is named HD 188753 and can be found in the constellation Cygnus 149 light years away. HD 188753 is the first planet to be seen orbiting a multi star system. On June 14, 2011, A team led by Dr Stephen Potter and Dr. Encarni Romero-Colmenero found evidence for the existence of a planet orbiting a true binary system (known as UZ For). Planet Kepler-16b also in the constellation Cygnus was found to be orbiting two stars in a system about 200 light-years away. Kepler-16b circles the two stars at a distance of 65 million miles, while the stars themselves circle each other more closely. This planet has been informally named Tatooine because of its resemblance to the fictional planet. NASA's Kepler mission has found the first multi-planet solar system orbiting a binary star, characterized in large part by University of Texas at Austin astronomers using two telescopes at the university's McDonald Observatory in West Texas. The finding, which proves that whole planetary systems can form in a disk around a binary star, is published in the August 28 issue of the journal Science. "It's Tatooine, right?" said McDonald Observatory astronomer Michael Endl. "But this was not shown in Star Wars," he said, referring to the periodic changes in the amount of daylight falling on a planet with two suns. Measurements of the star's orbits showed that daylight on the planets would vary by a large margin over the 7.4-Earth-day period as the two stars completed their mutual orbits, each moving closer to, then farther from, the planets (which are themselves moving). The binary star in question is called Kepler-47. The primary star is about the same mass as the Sun, and its companion is an M-dwarf star one-third its size. The inner planet is three times the size of Earth and orbits the binary star every 49.5 days, while the outer planet is 4.6 times the size of Earth with an orbit of 303.2 days. The outer planet is the first planet found to orbit a binary star within the "habitable zone," where liquid water could exist and thus create a home for life. However, the planet's size (about the same as Uranus) means that it is an icy giant, and not an abode for life. It's a tantalizing taste of discoveries waiting to be made. The combination of observations from the NASA mission and McDonald Observatory allowed astronomers to understand the characteristics of Kepler-47's two stars and two planets. The Kepler mission looks for minute dips in the amount of light coming from a star that might indicate a planet is passing in front of it, an event called a "transit." The space telescope is also adept at identifying eclipsing binary stars, in which two stars pass in front of each other as they orbit each other. In the case of Kepler-47, they found both stellar eclipses and planet transits in one system. So Kepler astronomers Jerome Orosz (lead author on the study) and William Welsh of San Diego State University flagged the Kepler-47 system as worthy of follow up from the ground. They asked the McDonald Observatory Kepler team to work with them. 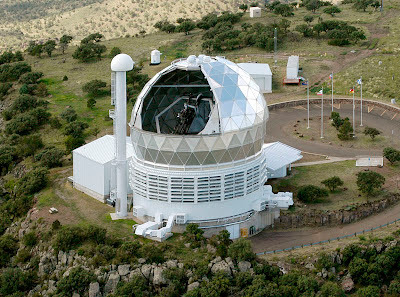 The Hobby-Eberly Telescope (HET) at The University of Texas at Austin's McDonald Observatory in West Texas. HET is a joint project of a joint project of UT-Austin, The Pennsylvania State University, Ludwig-Maximilians-Universität München, and Georg-August-Universität Göttingen. Endl studied the binary star with the 9.2-meter Hobby-Eberly Telescope (HET, one of the world's largest telescopes), as well as the 2.7-meter Harlan J. Smith Telescope at McDonald. "The challenging thing is that this is a very faint star," Endl said, "about 6,000 times dimmer than can be seen with the naked eye." He was taking spectra of the system — looking for characteristics in its light to indicate the motions of the primary star. (The secondary star is too faint to measure.) The McDonald observations enabled astronomers to calculate the mass of the primary star. These values, along with the Kepler eclipse and transit timings, were plugged into a model that calculated the relative sizes of all the bodies involved, Endl said. The Kepler team at McDonald Observatory also includes Bill Cochran (a co-Investigator of the Kepler mission), research scientist Phillip MacQueen, graduate students Paul Robertson and Eric Brugamyer, and recent graduate Caroline Caldwell. "This is the type of research where McDonald Observatory really excels," Cochran said. "We have excellent scientific instruments on our telescopes, and the queue-scheduled operation of the HET allows us to obtain spectra at the optimal times when they will give us the best information about the stars."